The series concludes on Saturday, December 2, with a special showcase for San Diego jazz legend Mike Wofford, entitled “Some Of My Best Friends Are…” Wofford takes his cue for the title of this program from a series of recordings by the late great bassist, Ray Brown. 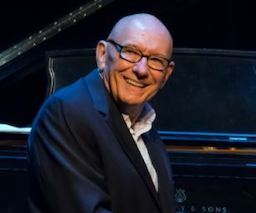 For this concert, he has assembled a cast of some of his favorite performers to play in intimate duos and other instrumental combinations: bassist John Clayton, drummer Lewis Nash, guitarist Larry Koonse, saxophonist/clarinetist Ken Peplowski, and the exceptional jazz flutist (and his wife), Holly Hofmann. Mike Wofford’s first performances date to the 1960s with the Lighthouse All-Stars and the bands of Shelly Manne, June Christy, and Shorty Rogers.